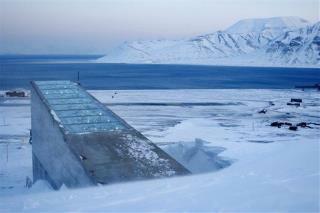 (Newser) – Earth is now slightly better prepared for an agricultural apocalypse: The "Doomsday Vault" is 20,000-species stronger as of this week—its sixth birthday. A new wave of seed varieties were deposited that hail from more than 100 countries and represent a "sort of winter Olympics of crop diversity," per the director of the trust that maintains the facility. Among them: varieties of Japanese barley that will ensure the world won't lose its access to miso should disaster strike, reports the Independent. Samples of that key miso ingredient, along with Brazil's "common bean," a rare Tennessean red okra, and nearly 200 types of wild potato have been added to the 820,619 samples that have been placed in the vault since it opened in 2008. It was constructed to hold up to 4.5 million seed samples, and sees one to two new deliveries each year, notes the Guardian. It is also interesting to add that there is a private space station being planned and built that will be able to sustain up to 100 selected people for up to 1 year. So after doomsday occurs, cockroaches will ... ... go up to the Arctic Circle ... swim out to this rock ... open up the impenetrable vault ... and become farmers? What genius came up with this plan? Is this privately funded by someone making a good profit... ... or some idiotic misguided publicly-funded moronic multi-government buearuacy? They need 4 sets of airlock doors to survive climate change?!?! I can do that with 1 storm door that has an interchangeable screen/glass section.